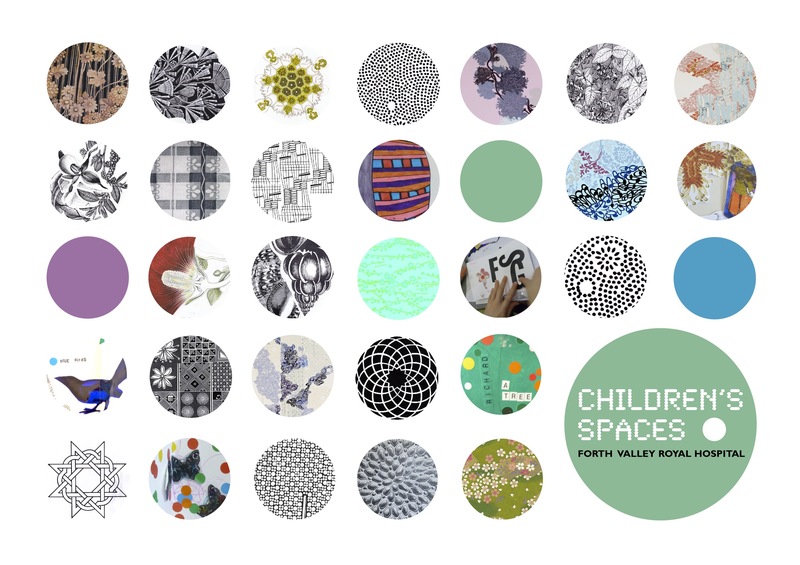 The Children’s Space project aims to create a more welcoming environment for young patients, using imagery that is relevant to young people, providing visual continuity between Emergency, Theatres and Wards. 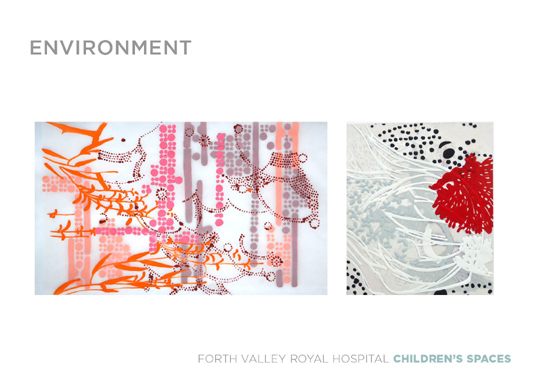 Artwork has been conceived through consultation and creative collaboration between visual artist Sharon Quigley, young people and their families at FVRH over the last 6 months. 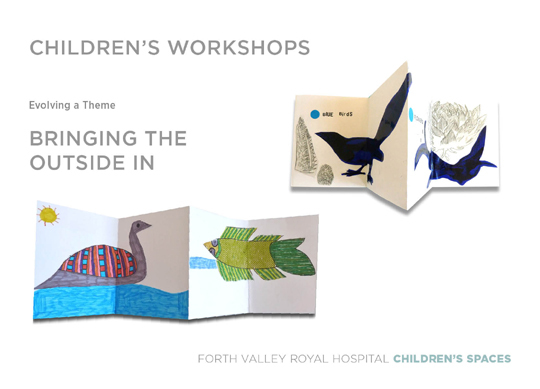 This first phase of participatory artwork offered children and young people a range of imagery from sources as diverse as fashion, sport, nature, animals and people, to create ‘virtual shelves’; a shelf, on which you could place anything that might make your hospital visit more interesting or enjoyable. Much of the imagery created during this phase of consultation drew inspiration from the natural environment; birds perching/singing, flowers growing, rainbows, butterflies etc. It was clear that young patients wanted to bring the ‘outside in’ to the wards and corridors of the hospital. This idea of bringing the ‘outside in’ was the starting point for the next 10 week block of workshops exploring birdsong through instrumentation, drawing and sound. 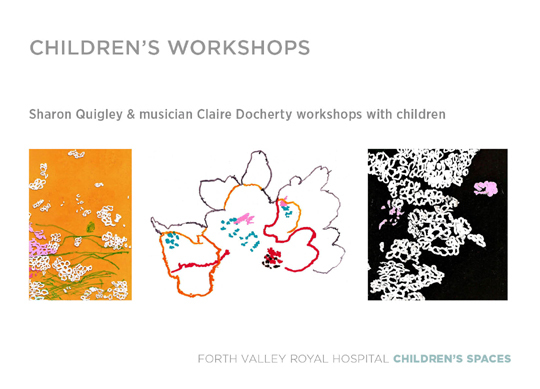 The initial sessions combined visual art and music, delivered on the Children’s Ward in collaboration with musician Claire Docherty. Young people had already demonstrated an interest in what lay outside the windows of the ward and I wanted to encourage them to think about their immediate landscape in a different way, considering its sounds, textures, patterns and shades. Whilst listening and drawing we also captured the rustling of leaves, the sway of trees, the fluttering of butterfly wings and the pitter-patter of falling rain. Using sound/music, worked well for both older children who felt self-conscious about drawing and younger children frustrated by their inability to capture their ideas in drawing. The results are automatic sound drawings, made whilst listening to the birdsong of local birds found in the Forestry commission land which surrounds FVRH. These drawings also functioned as musical scores that once drawn were played back by Claire and the young people themselves. 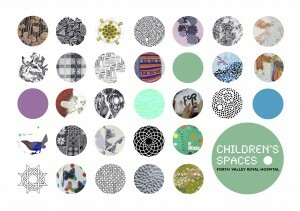 Over 250 feedback postcards were left in different areas of the hospital and also used to engage children, their siblings and parents with the Children’s Space project on the Children’s ward, encouraging ideas both written and drawn. 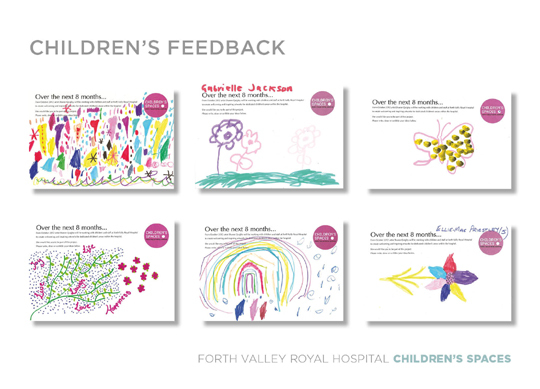 This feedback was captured over a 2 month period and nearly all returned postcards were visual, suggesting a brighter more dynamic and uplifting approach with themes referencing the natural world; flowers, trees, butterflies and rainbows. In September I approached artist Cameron Morgan to advise on the project. Cameron lives locally and grew up in the Royal Scottish National Children’s Hospital which had previously existed on the site of FVRH. His knowledge of the site is extensive and his personal links to the location give him a particular insight into the life of a young person growing up in an institution. It seemed important that someone like Cameron was given an opportunity to provide input into this project. 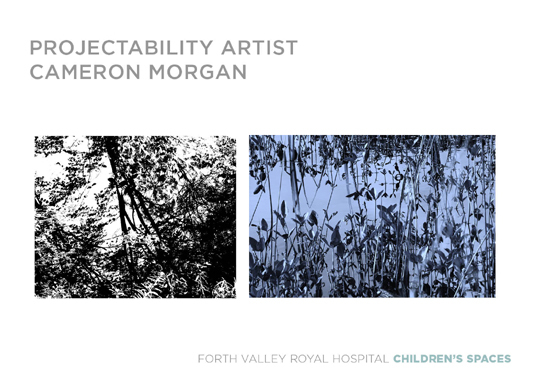 Cameron is an accomplished visual artist and photographer, who works and exhibits nationally and internationally with Glasgow-based disability arts charity, Project Ability. Cameron and I spent several sessions on the hospital site. We also sought advice from Gordon Harper the Forestry Commission Ranger, visiting the forest, talking about the site’s history and taking photographs to use as resource material in workshops with young people on the Children’s Ward. 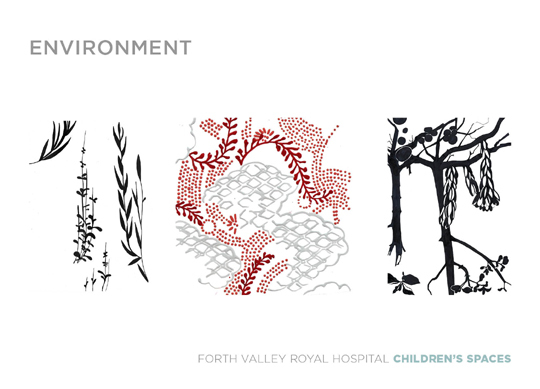 Cameron was keen to develop his photographs into distinct patterns that would represent the variety of plants and trees specific to FVRH grounds, creating a camouflage which could form a starting point for visuals in corridors and wards. 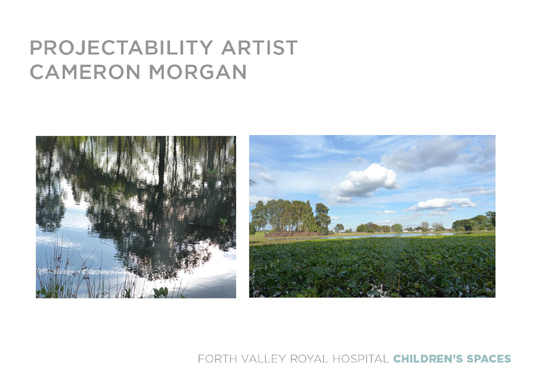 Using Cameron’s photography and the subject matter presented by young people I started to work through a series of paintings and drawings based on the flora and fauna which surrounds the hospital. Working onto layered tracing paper and oil primed boards with damar resin and pen; I started to reflect on the landscape and observations made by young people during the sound workshops. 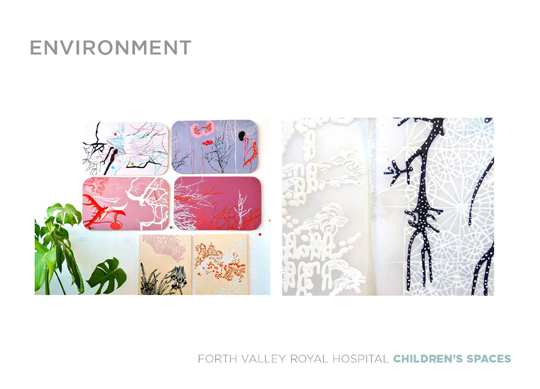 The drawings and paintings that develop represent layered hailstone and rain patterns, wave and cloud forms, branches and boughs with ferns and lush vegetation, found on the door step of Forth Valley royal Hospital. 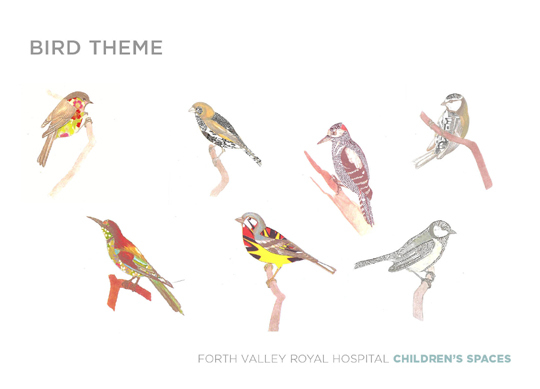 Throughout the sound drawing workshops young people also created simple, patterned bird collages, based on local birds. These collages were a quick an easy way to involve young people in the project who didn’t want to take part in a session that involved instrumentation or sound and worked particularly well for young people who had limited time in the ward to participate. 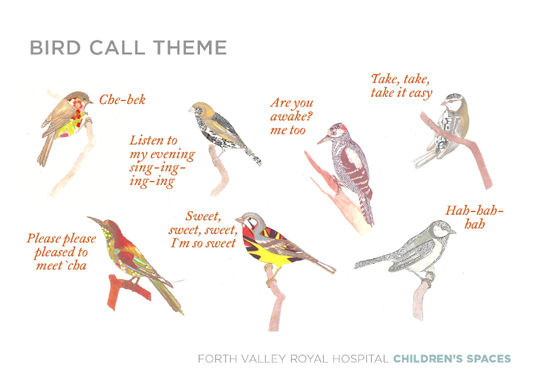 Patterned birds were paired with phonetic and mnemonic bird sounds, some fictional but others based on popular mnemonic phrases. This will be achieved by taking the architect’s treatments and extending them, considering and complementing what’s already. Develop repeating motifs to encourage way-finding and a strong identity. Several of the above-mentioned bird-boxes had sounds associated with them which are triggered when approached. These sounds were created by sound artist and experimental musician Robert Baldock who makes much of his music under the name AMS. The sounds were based on recordings of children and adults making bird-like sounds (either vocally or with toy instruments) as well as actual field recordings of birds which were layered and processed.